So a friend of a friend was having a wedding and wanted some ideas for a few decorations. It was an outdoor wedding and had a rustic theme to it. We were researching some cool ideas that we could make on a budget and saw a few posts about tin cans and jars with candles in them. 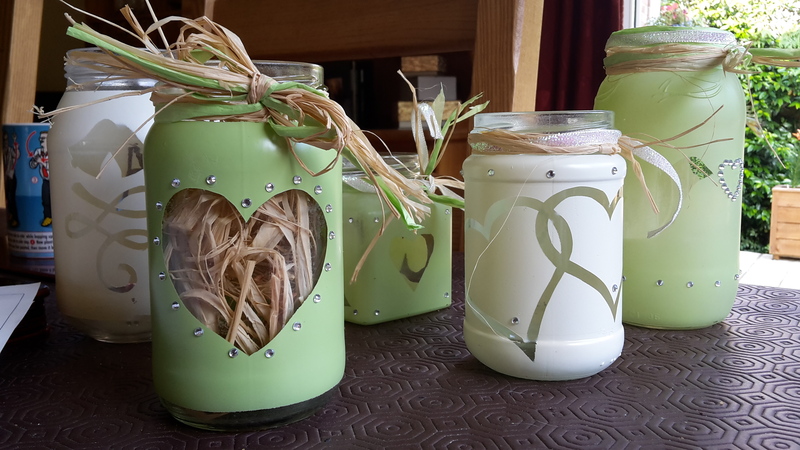 After a few trials we decided the jar idea was cool and added a little twist, and here’s what we ended up with. If you like them there is a quick tutorial with some pictures below. Collect all the jars you can get your hands on, all different shapes and sizes so you have a good choice. It only took us a few days as we asked friends and family if we could take a few from their recycling. Once you’ve got your hands on a fair few you can pick which shapes and sizes you like. The bigger ones are good for flowers. Make sure you give them a good scrub too, the last thing you’ll want is the smell of pasta bake at your event! Now you can start drawing your designs. Start off with something simple first, and make sure you separate the shapes so you don’t end up with a random blob. 3. 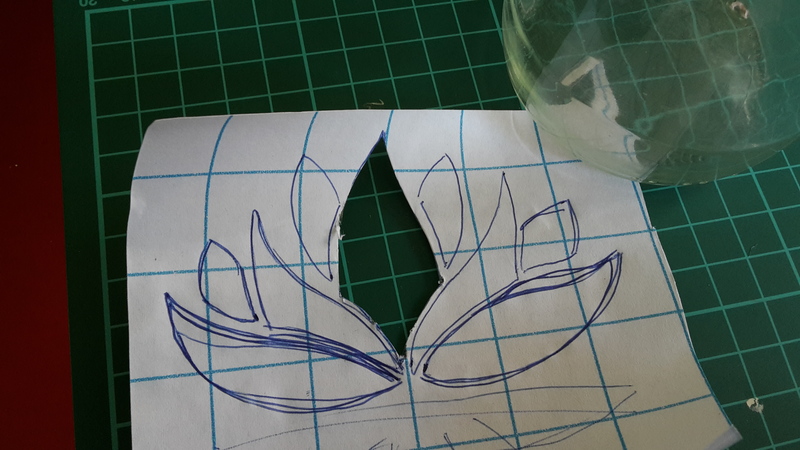 Now the fiddly part, use the blade to cut out your designs on the cutting mat, making sure not to cut into them. 4. Carefully peel the paper off the back of the plastic and stick it to the jar, if you place it wrong it easily peels off so you can adjust it. If you want clean lines at the top and bottom of your jar you can use masking tape to seal it off. 5. Make sure you have a well ventilated area and place the jar upside down on your paint surface. Shake the paint can and spray the jar from about 30cm slowly spraying left to right. It’s up to you how transparent you want it, a thin layer looks nice but a slightly thicker layer shows your design off more. Keep rotating the jar until it’s covered to your liking and wait to dry. 6. Now the satisfying part. 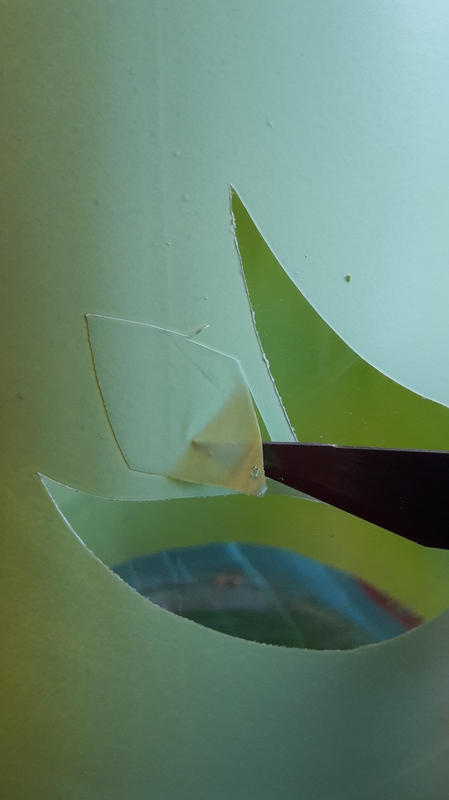 Take the tip of your blade and carefully lift up a corner of the sticky plastic, once you have a corner it is easy to peel off, do this for all the pieces of plastic and slowly see your design appear. 7. It’s completely up to you how you decide to dress up the cool new jar. Since our jars were wedding themed we used diamantés from a craft store and some ribbon and twine for the rim to add to the rustic theme. 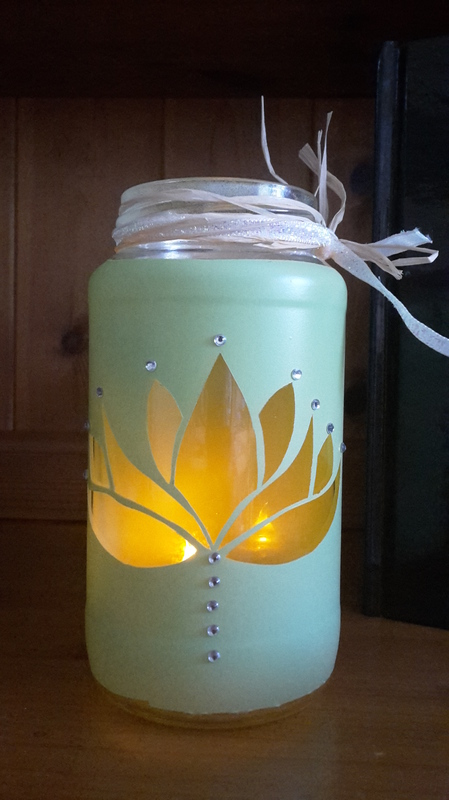 You can pop a candle inside (the little electric tea-lights work well) or flowers for the taller ones. love this idea!! will definitely be trying soon!